How far will you go to find love and happiness? Kevin Anderson lost his opportunity to play basketball during his senior year at college. Determined to not let his extraordinary athletic ability go to waste, Kevin trains for a chance at the pros. Basketball is only matched by his love for music—one is his talent, the other is his passion. Trinity Brown keeps her life on track as she focuses on finishing her last year of college. She is shocked when her admiration for a local deejay captures his attention. Unsure of their future, Trinity is torn between her feelings for Kevin and her responsibility to her family. Kevin soon realizes that his talent for basketball and his love of music means nothing if he doesn’t have Trinity to share it with, but he’s unsure if she feels the same. He’s not giving up on her without a fight. Can Kevin convince Trinity that the beautiful music they make together is worth fighting for? Or will he lose Trinity to a family that threatens to pull her away? The Andersons are back and I'm happy about it. 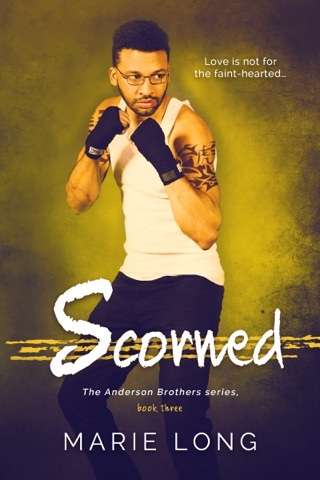 After reading Scarred, I really could not wait until this book was released. Kevin caught my attention the way he related to his brother. The chemistry between Kevin and Trinity was undeniable. And though I fell for Dom faster and harder than I ever did Kevin, the romance and chem in this installment eclipsed the previous book. The pace was also faster in this one as well. The male POV was still the same and I loved that. It makes reading the story strictly masculine. I only once, very briefly, wished that I could get into Trinity’s head but like I said it was fleeting. This is only sort of a standalone. No, they don’t end in cliffhangers but I would recommend reading the first in the series to get the complete story.